Today Matterport is excited to announce a great new feature for all of our Matterport VR Spaces: Floor Plan Navigation. This feature allows users to quickly and easily navigate across the VR Space — not only from room to room, but also from floor to floor effortlessly. It gives users a true sense of the size and layout of the property they are exploring so they can understand the VR Space as a whole. Since launching our VR Beta program over two years ago, the ability to more easily navigate through the VR space was one of the most commonly requested features we’ve received. Unless you were already familiar with the property, it was common to miss a room or even an entire floor. 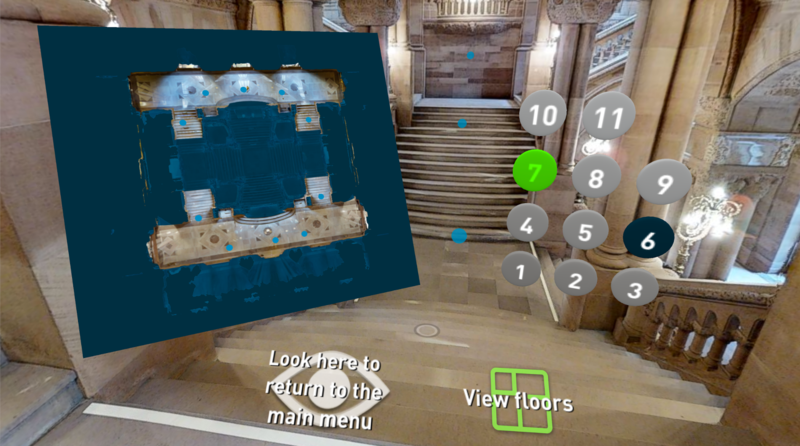 Floor Plan Navigation makes getting around a Matterport VR space extremely easy. With the Floor Plan Map, you can see an entire overview of the VR Space (so you won’t miss a room or floor) and a arrow marker to note your current location (so you won’t get lost). In addition, you can also quickly jump around a giant property without having to navigate point by point. We’re enabling Floor Plan Navigation for all Matterport VR Spaces, both new and old. 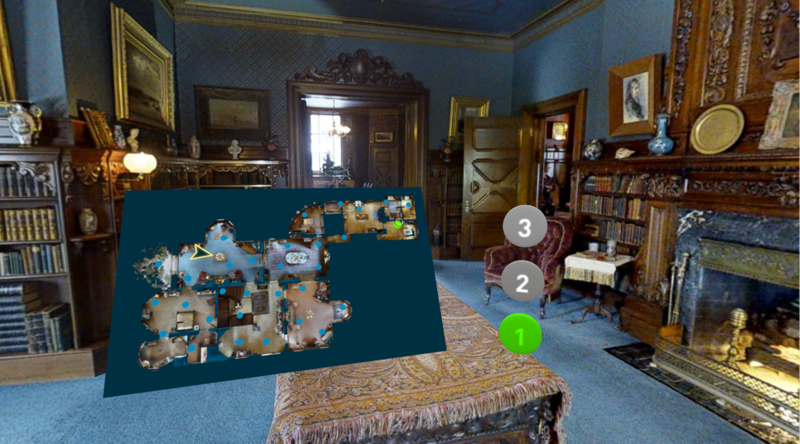 Just update to the latest version of the Matterport VR app for iOS, Android or GearVR. You’ll then be prompted to update any previously downloaded VR Space. Any new VR Spaces will automatically include a floor plan. To dismiss Floor Plan Navigation, you can either choose another point on the floor plan map, choose another blue scan point as normal, or select the “View Floors” button a second time. When the Floor Plan Navigation menu first opens, the arrow on the map shows your current location and the direction you are facing. Move to a new point by selecting a blue navigation point on the floor plan map. Sometimes, for clarity, we will only show a few representative blue navigation points per room on the floor plan map instead of showing every available point. But don’t worry, once you navigate to a certain room or area in the space, you can still go to all the other blue navigation points nearby. VR Spaces with multiple floors will have “elevator buttons” on the right for each of the different floors. Dark blue button — the floor you are currently viewing in VR. Green colored button — the floor you are currently viewing in the floor plan map. The lowest floor is always labeled as 1. Spaces with just one level will not show any elevator buttons. What's Next for VR and WebVR? 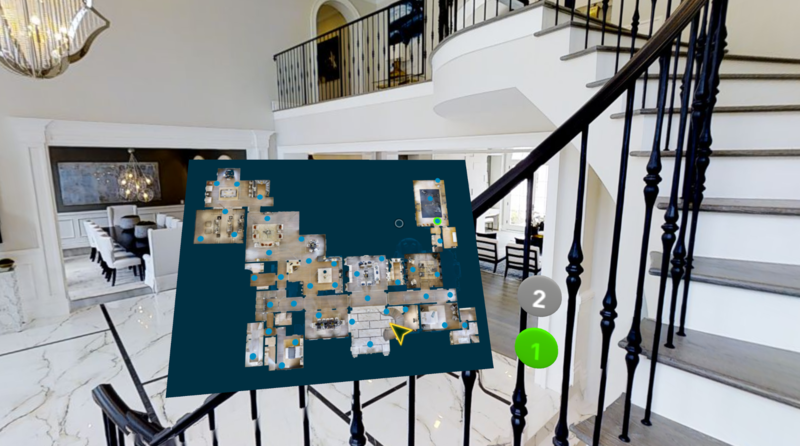 Floor Plan Navigation feature is currently only available if you download a VR Space with our Matterport VR apps. Support for WebVR will come next year. In addition, we’re also working on supporting Mattertags in VR for next year. Stay tuned for more updates!